Who Turned on the Heat? – The Unsuspected Global Warming Culprit, El Niño-Southern Oscillation is Now Free. Copy here. This post has been updated to reflect that it’s now free. The Updated Preview includes the Table of Contents; the Introduction; the beginning of Section 1, with the cartoon-like illustrations; the discussion About the Cover; and the Closing. Who Turned on the Heat? cover. Have you searched the web, looking for information about La Niña and her big brother El Niño? You know, those colossal cooling and warming events in the tropical Pacific that cause flooding in some parts of the world, drought in others—heat waves here, cold spells there—blizzards and record snowfall in your driveway, but a snow-free winter at your favorite ski resort. Yup, those El Niño and La Niña. Scientists have given them that highfalutin name El Niño-Southern Oscillation or ENSO for short. Then, if you make a mistake and spell it ENZO with a “Z” in your search engine, you wind up watching a video from BBC’s Top Gear, of Jeremy Clarkson and The Stig driving a Ferrari F60 owned by Pink Floyd drummer Nick Mason in exchange for plugging Nick’s book. That’s a nice diversion, though. As your search continues, you keep finding technical web pages with very similar overviews, and, if you’re lucky, three schematics: one for El Niño conditions, one for La Niña and one for ENSO-neutral or “normal” conditions. Frustratingly, those three illustrations look the same to you, leaving you scratching your head. No matter where you turn, what you read, you still have no idea what they’re talking about. But you still want to know what those blasted El Niño and La Niña things are all about. Grrr. Who Turned on the Heat? begins with 29, not 3, cartoon-like illustrations, with text right there on the drawings, that explain the processes of ENSO with easy-to-understand terms. After presenting some background information at the beginning of that section, the discussions of ENSO start with “normal” (a.k.a. ENSO-neutral) conditions in the tropical Pacific, then move on to the transition from ENSO-neutral to El Niño with an overview of what causes the El Niño to begin. That’s where the free Updated Preview of that section ends. In the book, it continues with a presentation of El Niño conditions and the transition back to ENSO-neutral, then on to La Niña and eventually back ENSO-neutral again, providing readers with a complete overview of the ENSO phases in sequence. It discusses how La Niña is not the opposite of El Niño. The phases all fit together logically. Mother Nature’s pretty good about things like that, but she still has some tricks up her sleeves. For those readers who haven’t looked at or read anything technical since high school, the next section discusses very basics things like how to read a graph. It presents the types of graphs used throughout the rest of the book, and a bunch of other introductory topics. Section 3 of Who Turned on the Heat? is a more detailed overview of the phases of ENSO—it includes graphs of satellite-based sea surface temperature and other variables, color-coded maps, links to animations—all of which are furnished to support and confirm the naturally fueled processes of the ENSO-neutral, El Niño and La Niña phases. In other words, the fundamentals of ENSO are presented and documented in detail. That’s followed by a section that discusses topics that are still related to El Niño and La Niña but are beyond the basics, like what actually triggers an El Niño. Did you know that El Niño events are so big that sometimes it takes a couple of tropical cyclones (yup, the same things as hurricanes) in the western tropical Pacific just to kick-start one? What may become your favorite section of Who Turned on the Heat? is next. In it, the sea surface temperature data presents how it accounts for global warming. The combined long-term effects of major El Niño and La Niña events are presented, discussed and documented—with satellite-based sea surface temperatures data, not climate models. Major El Niño and La Niña events are not like the smaller ones. Far from it. The big ones are responsible for the vast majority of the natural warming of the global sea surface temperatures for the past 30 years. Yup. You’re right, that’s the time the climate models used by the IPCC say that only greenhouse gases could have caused the warming. Those scientists, who must have their heads immersed in climate models, apparently haven’t bothered to come out into the real world long enough to examine the sea surface temperature records for the last 3 decades. If they had, they’d find the data doesn’t agree with the models. All the modelers would have had to do is divide the global oceans into 3 logical subsets. Then they could see why sea surface temperatures have warmed and that Mother Nature’s two rambunctious children La Niña and El Niño were the primary natural culprits. Logically, those energetic natural siblings can explain most of the warming of land surface air temperatures, too, since temperatures there simply mimic and exaggerate the short- and long-term variations in sea surface temperatures. Of course, anthropogenic global warming exists; that is, there’s a small part of the land surface air temperature warming that can’t be explained by the natural warming of sea surfaces, and that small portion is likely manmade, with a host of contributing factors. But back to the oceans: natural variables can also explain their warming to depths of 700 meters—a dataset called Ocean Heat Content. That would have been a great section on which to end Who Turned on the Heat? Who Turned on the Heat?continues with three more sections. One presents links to additional animations so that you can watch the cumulative effects of an El Niño and La Niña as they took place. Remember, La Niña is not the opposite of El Niño—there are some not-so-subtle differences between the two phases. The next section presents the myths and failed arguments that proponents of manmade global warming have created to try to downplay the long-term effects of major El Niño and La Niña events. The last section is Q&A. Take a look at the Updated Preview of Who Turned on the Heat? Scroll down through the Table of Contents. Who Turned on the Heat? weighs in at a whopping 550+ pages, about 110,000+ words. It contains somewhere in the neighborhood of 380 color illustrations. In pdf form, it’s about 23MB. It includes links to more than a dozen animations, which allow the reader to view ENSO processes and the interactions between variables. After reading Who Turned on the Heat? you should have a better understanding of El Niño and La Niña—AND—you should understand why global surface temperatures warm during multidecadal periods when El Niño events are stronger, occur more often and endure longer than La Niña events. The most recent period with ENSO conditions weighted toward the El Niño phase started in the late 1970s, and it’s no coincidence that global surface temperatures have warmed since then. Also not by coincidence, La Niña events dominated ENSO, but just a little bit, from the mid-1940s to the late-1970s, and global surface temperatures cooled slightly. Why did surface temperatures warm from the late 1910s to the mid-1940s? Yup, ENSO was skewed toward El Niño during that period, too. 1. Sea surface temperature data for the past 30 years show the global oceans have warmed. There is, however, no evidence the warming was caused by anthropogenic greenhouse gases in part or in whole; that is, the warming can be explained by natural ocean-atmosphere processes, primarily ENSO. 2. The global oceans have not warmed as hindcast and projected by the climate models maintained in the CMIP3 and CMIP5 archives, which were used, and are being used, by the Intergovernmental Panel on Climate Change (IPCC) for their 4th and upcoming 5thAssessment Reports; in other words, the models cannot and do not simulate the warming rates or spatial patterns of the warming of the global oceans—even after decades of modeling efforts. 3. Based on the preceding two points, the climate models in the CMIP3 and CMIP5 archives show no skill at being able to simulate how and why global surface temperatures warmed; that is, the climate models presented in the IPCC’s 4th and upcoming 5thAssessment Reports would provide little to no value as tools for projecting future climate change on global and regional levels. Again, Who Turned on the Heat? 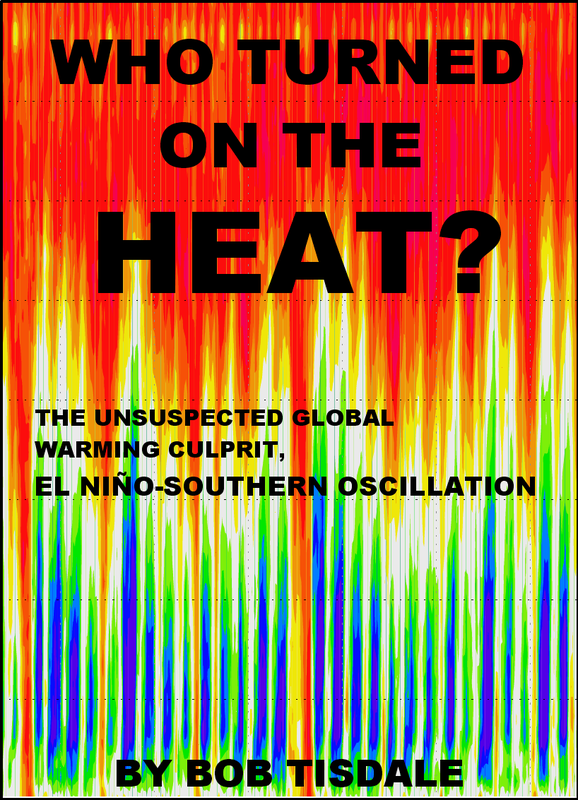 – The Unsuspected Global Warming Culprit, El Niño-Southern Oscillation is now on sale in pdf form for US$5.00 – Please click here to buy a copy. For those who would prefer a Kindle edition, I haven’t decided if I’m going to publish it in that format. Due to the massive number of color illustrations, the Kindle edition price would be somewhere close to US$16.00. Personally, I think that’s a little steep for an e-book. And since other electronic versions of a book have to be priced 20% higher than the Kindle edition, that would make the pdf version about US$19.00, and that’s way too high. Right now, US$5.00 sounds like a bargain for an easy-to-read, well-illustrated, well-documented book about El Niño-Southern Oscillation and its long-term effects on global surface temperatures. If you have any questions about the content, please ask them on any thread at my blog Climate Observations. The Updated Preview (typos corrected) is now linked in the post. Erratum (Hopefully Won’t Change To Errata): Page 27 of text, line 7 – eastward, should read westward. Same typo is on page 27 of Preview. Refer also to “Who Turned on the Heat?” Typos. This entry was posted in El Nino-La Nina Processes, Essays & Books, Natural Warming. Bookmark the permalink. Best of luck with it Bob, I hope my review drives a few sales your way. Just bought my copy. Looking forward to a good read and a better understanding of the weather. I thought I bought a copy, I have a receipt — but where do I download the pdf? Bill Hudson: After you paid, PayPal should have returned you to the website that provides the downloads. Check the email receipts. One should be from PayPal. The other one from Digital Delivery Apps should have a download link. If not, let me know. And I can get you a copy. I have not read the book, but I did follow your discussions over the years. You seem to have a good case for the effect of ENSO being a major factor in any variation. However, I want to make one major exception to your claims. The fact that long wave radiation (so called back-radiation) does not penetrate into the ocean has nothing to do with the atmospheric greenhouse effect, or heating of the ocean due to greenhouse effects. On average (combined day, night, and seasons) upward radiation always is larger than back radiation, since the Sun is the source of the surface energy, and the lapse rate is a decreasing temperature with altitude. However, the addition of greenhouse gases IN THE ABSENCE OF FEEDBACK would raise the average altitude of outgoing radiation to space, and this combined with the lapse rate would result in ground level being warmer. The greenhouse gas in that case is a radiation resistance, and results in slower net radiation loss from ocean surface. However, at equilibrium, convection and evaporation make up the difference AT A SLIGHTLY HIGHER TEMPERATURE. However, notice I said ignoring feedbacks. In reality, the tendency for slightly higher temperature seems to cause negative feedback, as many real processes in nature do. The result is likely more clouds, and less increase in temperature than otherwise. Since the CO2 plus negative feedback has little net effect, your arguments for the effect of ENSO may still be the main driver for the swings we see. Any chance you that you would use a PayPal option such that I can pay via credit card but not have to establish a PayPal account? You had it working that way for _If the IPCC…._. I am really not keen on setting up a PayPal account. As far as I know, you do NOT have to set up a PayPal account. I purchased a copy through PayPal last night, using a credit card and a different email address, just to make sure things worked. On the PayPal page, I clicked on credit/debit or whatever the prompt was. Then where it asked me set up a PayPal account, I didn’t click on the box, but scrolled down to the bottom of the page and clicked on whatever icon sent me to the transaction page. I completed the transaction there, without having to set up a PayPal account. Leonard Weinstein: My argument has basically been that the sea surface temperature records for the past 30 years show no evidence of warming from anthropogenic greenhouse gases. Climate model simulations, the model mean, represent how sea surface temperatures SHOULD warm IF they were warmed by greenhouse gases. But the sea surface temperatures have not warmed as simulated by the models. Their The sea surface temperature records indicate they warm via ocean-atmosphere processes, primarily through ENSO. Bought a copy and everything went smoothly. Cold tongue of La Nina has appeared recently near the Peruvian coast, so watch out! Thanks. Where today I see the option to pay with credit or debit card, yesterday I thought I saw only the option to create a new PayPal account. All fine now! Hey Bob, just finished reading the preview and am now downloading the book. Great work, I’ve always been interested in El Nino/La Nina but was afraid to ask questions about it 🙂 But really I didn’t know where to look. I’m going to read through the book now. Quick question: do you care to make a guess on whether or not a new La Nina is about to get started in the next couple of months? Bob: if back radiation only penerates the first few milimeters does it then mean that the oceans are not affected by the greenhouse effect? If they are affected how do they get warmed? The sun without the greenhouse effect can’t warm the oceans. Does that mean the back radiation warms the land and that heat is somehow transferred to the oceans? Everything else being equal, if the earth would have only 10% land would the oceans be cooler than they are today (I know, tricky question)? Sorry for the n00b question, I’ve only read the first part of the book. I bought a copy and would like to buy another copy to give (as a surprise) to someone I think would like it. Is this possible? If so, how? NeedleFactory: I don’t know, but I’ll ask? I believe the link you’d need to email only remains open for an hour or two. I’m also checking to see if the delivery keys off the buyer’s IP address. If it does then it’s not possible. Sorry about the delay in replying. Are you saying that because solar radiation hasn’t increased in the past 30 years, that it can’t contribute to the warming? * black body earth: global temperature 33K less than today. * earth with only ocean and no greenhouse gases: global temperature less than blackbody earth because water albedo is lower? * earth with only ocean and greenhouse gases: ??? * earth with oceans, 30% land cover, greenhouse gases: global temperature higher than without land cover? devijvers: If there were two earths and one was only covered in ocean while the other was only covered in land, which would be warmer? The one that was only covered in ocean would be warmer, because downward shortwave radiation penetrates and warms the oceans to depths of 100 meters while the oceans can only release that heat at the surface. The oceans have their own greenhouse-like effect. I dont want the accolade for the dumbest post but can i buy “who tuned up the heat” in the ancient format of… an actual book? NeedleFactory: I figured out a way for you to send a link as a gift. Can I email you using the address you’re using for the screen persona? Godric: You’re not the only person wanting a hard copy. There are a number of people at WUWT wanting them. The cost for a paper version is astonomical. There are 550+ pages with about 380 color illustrations. I took a quick look at bound book pricing when I thought there would be only 480 pages and, if memory serves, the vanity presses were talking well in excess of $100 maybe $150 for the lower number of pages. I won’t buy one for me. is this based on anything that Carter Defreitas and Mclean tried on with their ENSO debacle. How about a free copy so we can see your justification for this apparent nonsense. sillyfilly: Nope it has nothing to do with their paper. In fact, their paper is not mentioned in the book. Nothing in life is free, sillyfilly, especially when you attempt to insult the author. I’d say that portrays a high level of ignorance on your part, which is typical of your ilk. Caught this from Tamino web site: the basis for my scepticism of your analysis. WUWT has a post by Bob Tisdale, based on one of Tisdale’s own posts. The theme is that ocean heat content (OHC) hasn’t risen as fast as GISS model projections. Watts even says “we have a GISS miss by a country mile.” But Tisdale can only support his claim by using tricks to hide the incline. In fact he uses two of the favorite tricks of deniers. One is a clever, but hardly new, trick called “cherry picking.” The other is ridiculously simple: misrepresentation. Any comments on what appears to be an extremely structured and well researched analysis? And why do you adopt prose rather that putting your hypotheses to scientific scrutiny? So where’s the correlation let alone causation? I am working my way through your book. Thanks. I too would like to purchase extra copies to send to friends and associates – it would be desirable that copies are watermarked with the recipients name rather than mine… Is this possible? Alternatively they could be watermarked as “Gift from xxxxxx xxxxxxxx”. You can send a reply email to this address or to the one I used when I purchased the book through Paypal (hotmail.com) – shouldn’t be too difficult to find (Jim = James :-). sillyfilly: Phillip, don’t you think the taxpayers of New South Wales would expect you, first, to be working while you’re on the time clock and, second, not to be using one of their computers for your personal entertainment—or are you simply using your work email address for personal communications for other reasons? In response to your three most recent comments above, you have done a wonderful job of illustrating just how little you know of the subject matter. You have no grasp at all. None. Are you aware that I included numerous discussions of sea surface temperature data in the book? No. Are you aware that the vast majority of the book pertains to sea surface temperature data, and explains the natural warming of it? No. Are you aware that the MEI was presented in my book as one of many ENSO indices? No. That aside, let’s concentrate on Tamino’s nonsensical post that you linked. Apparently you’re not aware that I responded to Tamino’s post. A hint for you. That’s why blogs have search functions, or didn’t you notice the one on this webpage? That function allows people with a twinge of intelligence to search past posts based on a subject–Tamino, for example–to determine if I had actually responded to Tamino’s drivel. That way they wouldn’t ask a question based on ignorance and make fools of themselves—something you seem to enjoy doing. YOU, Phillip, highlighted YOUR ignorance for everyone who visits this thread from this day forward. Phillip, you’re wasting your time. More importantly, you’re wasting mine. I said good-bye nicely to you at the end of my last reply to you. You didn’t pick up on the obvious intent. Go home and study the subject matter and come back in a decade or two when you’re up to the level of the people who visit here, if you can reach that level. Take this to heart. You’re permanently banished here. I’ve got better things to do than reply to your childish attempts to belittle my work. Bob, thx, got it. I’ve decided to compare 20th century arctic ice extent to 20th century El Nino activity in a graph. Seems like a match, doesn’t it? Thank you for your reply. Wow, 100-150$…. I’ll down load it then. Keep up the good work and hope that rational thought and calm non political sanity prevails. James from Arding, check your email, please. Hi Bob, I sent you an email (via your gmail address and containing Paypal details) as I don’t appear to have received a link to the book yet. Is there anything I need to do? matthu: The download link went to another (older?) email address. Please check that account and confirm that you’ve received it. Sorry for the delay. Thank you very much, it’s a great book! Thanks for the link, Tallbloke. 3rd paragraph below image 2-27… Ships and buoys during?? Pingback: Tisdale’s August 2012 Sea Surface Temperature (SST) Anomaly Update | Watts Up With That? Like the HADSST2 data, the ERSST.v3b sea surface temperature dataset only relies on measurements from ships and buoys. As a result of reading your book, I will have to update mine to include brief digests of the vast store of information provided by you. Thanks for the kind words, Donald. Glad you’re enjoying it. Bob: I find your book convincing in many ways.But it seems to me that there is one question that you did not seem to deal with. Let’s accept the various conclusions you have drawn. In particular, that El Ninos provide a mechanism for net warming of the global atmosphere with lingering effects, and that El Ninos were prevalent early in the 20th century, diminished from 1940 to 1976, and then returned to dominance after 1976. And this sequence matches the reported changes in global temperature (also note that the mid-century dip in continental US temperature was much greater than the mid-century dip in global temperature – the US is more responsive to El Ninos than the globe). Now here is the big question: The earth was gliding along in the late stages of the LIA when a little after 1900, El Ninos suddenly began to dominate and did so until 1940. Although there was a letup from 1940 to 1976, overall, we may regard the 20th century as the century of El Nino dominance. If that continues, the earth will presumably continue to warm. Why did El Ninos emerge as dominant in the 20th century? Presumably they were not dominant from 1600 to 1900 since that was a cold period. Was the 20th century a statistical fluke? Can there be some connection (despite your arguments to the contrary) with human activity in the 20th century? An ancillary question is whether the lack of temperature rise over the past 12 years is tied to a lack of strong El Nino activity during that period. One postscript: Your Figure 4-88 on p. 270 clearly shows what we in California know very well: that in El Ninos, cloudiness increases (as well as rain). Yet it is amazing that Dessler (Dessler, A. E. (2010) “A Determination of the Cloud Feedback from Climate Variations over the Past Decade” Science 330, 1523-7.) claims that cloudiness is reduced as the temperature increases! Donald: Are you asking me to read the last chapter of a thriller to you when you’re halfway through the novel? See Figure 4-85 in Chapter 4-11. ENSO “skewness” is presently returning toward ENSO neutral, based on the 121-month filter. But if ENSO skewness shifted back toward El Nino again, surface temperatures would have to rise. Also, while the above hopefully answered your questions about global warming continuing at the pace it had from the late 1970s to 1998, please forget global temperature records extend back in time beyond last 30 years. That is, I’m puzzled by your reference to the Little Ice Age. My book deals primarily with the sea surface temperatures of the past 30 years. The Little Ice Age has no bearing on the content of this book. If the warming of global oceans for the past 3 decades can be shown to be natural, while the climate models can only create the warming with greenhouse gases, then the models are shown to be trash and the hypothesis of AGW, which can only be recreated with models, is falsified. That graph only presents Outgoing Longwave Radiation as a proxy for cloudiness at the central equatorial Pacific. It has nothing to do with California. You then tried to enter into a discussion of Dessler (2010), which has no bearing on the discussion of cloudiness for that specific portion of the equatorial Pacific. The graphs are very specific, and they are intended as references for specific discussions. Please don’t read anything more into them than they were intended to show. Bob, there’s a character claiming that ocean heat content has increased because oceans cannot efficiently radiate heat due to the increase in back radiation. This alleged phenomenon does not seem to have an effect on the NINO3.4 trend. Can you debunk this? Steven Devijver: Feel free to cut and paste this reply over at the other blog, but leave a link to this thread. Thanks. The claims being made by the blogger are nonsense. He’s never examined Ocean Heat Content data. If he had, he would not be making ridiculous claims like that. He’s simply parroting alarmist drivel from SkepticalScience. The oceans release heat through evaporation. The following four graphs are from my book. He should buy a copy. Hey Bob, just to alert you I’ve just been banned from /r/climate on reddit for claiming the rise in ocean heat content is not caused by man-made global warming. If you want to stick around, please stick to what the evidence shows. Claiming that ocean heat content isn’t raised by changes increases in atmospheric greenhouse gas concentrations is in the realm of complete nuttery at this point. Claiming that ocean heat content isn’t raised by changes increases in atmospheric greenhouse gas concentrations is in the realm of complete nuttery at this point. That’s a strong statement. There is no evidence oceans are heated by back radiation. There is no evidence oceans are inhibited in their release of heat due to increased back radiation. This leaves only one possible explanation: natural variability, in casu El Nino. Bob, your book is dangerous!! Please consider adding a warning label on the cover. Steven Devijver: Sorry. Obviously a website like that is not worth your time. Bob: I hope I am not wasting your time and I hesitate to continue this but I will give it a try. While it is true that your book focuses overwhelmingly on the past 30 years, many figures in your book also deal with the entire 20th century, as for example Figures 2-33 inclusively through 2-41, 4-12, 4-70, 4-71, 4-75 through 4-81, 4-84, 4-85, 5-7(mislabeled: should really be 7-7), 5-43 through 5-45, 7-1 through 7-3, 7-11 through 7-13, 8-6, 8-18 through 8-24. In addition Figures 4-22 through 4-26, 5-40, 5-41, 5-46, 5-48 through 5-57, 5-59, 5-60 and 5-62 deal with time periods considerably longer than 30 years. And in the spirit of looking at the whole 20th century, as you properly pointed out in many places, there were two periods (one early and one late) in which El Ninos were dominant and as a result, global temperatures rose. While it is true that you did not deal at all with the LIA, nevertheless, the beginning of the 20th century (or perhaps a few decades earlier) can be construed to be the end of the LIA. It seems clear that something changed around 1900 (or perhaps a couple of years later). Prior to that time, global temperatures were lower and there was no systematic rise in temperature. We might guess that El Ninos were not dominant in the LIA. Starting a little after 1900, there were two extended periods when El Ninos were dominant. The simple question is why? Is it possible that almost all of the warming of the 20th century was due to a change in the predominance of El Ninos due to causes presently unknown? I raised the question: Is there any connection to the rise in CO2 over that period? As you pointed out, no one (including Trenberth) has established any such relationship. In regard to the matter of cloudiness and Dessler, I got into a topic that you only barely brushed tangentially in your book. But nevertheless, it is important. One of the pivotal (even crucial) elements of global climate models is the question of how global cloudiness varies as the earth warms (attributed by modelers to rising CO2). The modelers all assume that cloudiness diminishes as the earth warms. But we all know in California (for example) that in El Ninos, cloudiness increases. Since, as you have amply shown, earth warming occurred in the 20th century during predominance o[f El Ninos, it follows that cloudiness increased when the earth warmed in the 20th century, and Dessler and the modeelrs have the wrong sign on this feedback. Since NINO3.4 SST records are rare before the opening of the Panama Canal, no one will know the answer. That is one of the points I was trying to sink home with the book. NINO3.4 SST anomalies have not warmed in 110+ years. And while El Niño events dominated over that period, they do vary between El Niño dominated (late-1910s to early-1940s, and mid-1970s to present) and La Niña dominated (early-1940s to mid-1970s) periods. If anthropogenic greenhouse gases are the cause for the El Niño dominance in the late period, why then did El Niño events dominate the early 20th century, and why did La Niña dominate after that while greenhouse gases were increasing? Trying to blame greenhouse gases doesn’t fit with the multidecadal variations in ENSO strength and skewness. That’s why AGW proponents manufacture other myths about ENSO. They try to neutralize it. I bought your book and am nearly half way through- except I’ll have to go back and reread a couple of sections… I’ve learnt a lot already- thanks! You’ve made things very clear. I am particularly interested in links between NINO indices and temperature, rainfall, and pressure in north east Australia. Perhaps when I’ve finished reading I’ll understand some things that appear counter-intuitive e.g. rainfall increase during transition from El Nino to normal or La Nina PRECEDING SOI increase. Possibly due to increased SE Trades bringing more moisture? Ken: I wish I had more of a background in precipitation responses to ENSO so that I could provide you with an answer, but most of my time and research has been geared toward showing people how the oceans have warmed naturally and why we know it’s natural. Pingback: Tisdale: The Warming of the Global Oceans – Are Manmade Greenhouse Gases Important or Impotent? | Watts Up With That? Pingback: Bob Tisdale: Who Turned on the Heat, also the IPCC Backtracking Again. The minute I read about your new book, I went to Amazon to try and buy it either in hard back, or paperback, or for my Kindle, but could not find it there. I can’t, with my old eyes, read comfortably in my mac, even if I lower the contrast to the lowest possible, and enlarge the text. So , if I bought the downloadable book, I would have to print all the pages, after having enlarged them. Very hard to do, especially for the charts. Are you going to get it published on paper like you did before ? viejecita: Thank you and best wishes for you, too. I can understand your difficulty reading a book on your computer. I’m looking over the top of my glasses while I write this. Sorry to say, at this time, I’m not planning to publish a Kindle version. But I may change my mind in 2 or 3 months. I purchased your book. Is it possible to re-do it with permissions allowed to put reader comments or highlights? Without some way to mark my place I have the devil of a time trying to find where I left off. Richard Patton: The book is written in MS Word, which I then used to save it as a .pdf. I have not found an option that would allow me to alter those functions on either of my computers. Sorry. When proofread in pdf form (just for the change of appearance), I kept track of where I was with the Table of Contents, which is linked to the sections and paragraphs. Is a paper edition going to be available. I dislike reading too much off screens. Robert Wager: Sorry. I have no plans for a paper edition. I looked into bound editions, and the costs, not selling prices, are well above US$100. At that price, even I don’t want a hard copy. The books that I published through a major publisher with hard cover are all way over $100. However my paperback “The Climate Debate” is for sale on amazon.com. If you do a search on amazon.com for “the climate debate” it comes out at the top of the queue. I self-published it through amazon.com’s subsidiary createspace.com. It cost me nothing to have them publish it. They have a “print on demand” approach so they only print copies as they receive orders. Yet, they respond surprisingly fast. And the quality of their printed copies is very good. You can charge almost any price for your book. They take out a percentage for their handling. I set the price of my book at $22. It is black and white. Bob uses a lot of color so that might affect things. I don’t know. Bob: You could certainly publish through createspace.com and provide hard copies to the public and not run up the cost too much. I would be glad to help. Congratulations on “Everything You Every Wanted to Know about El Niño and La Niña” and “Who Turned Up The Heat”. The animations that you published some time ago showed a lagged progression of heat energy (or lack thereof) from basin to basin, prompting me to follow you ever since. Lags and flows may well be significant missing variables. Your book synthesizes their mechanisms and effects. Since heat energy (or lack thereof) drives temperature observations, and since IPCC models rely upon observations for tuning and confirmation, your presentation makes sense. To the question from Richard Patton, September 17, 2012 (re comments or highlights): The need to secure the PDF is obvious, given so much work and insight on your part. I do, however, find the ability to highlight and annotate a PDF a useful tool, so long as it does not change the original document. Many pdfs I download (and all those I create through DeskPDF) allow the ‘commenting’ capability under the Security tab. If allowed, it shows up as a yellow balloon note and a T box with a highlighter icon in the top bar. Commenting is not allowed in your document, and I cannot change the defaults in DeskPDF except as a print profile (print to PDF). It may be possible to permit “commenting” when creating the PDF without allowing other changes. With best regards and many thanks. P.S. I tried to send this privately, but the email bounced. Pingback: Tisdales’ Blog Memo to Kevin Trenberth at NCAR | Watts Up With That? Bob, your book says that the 300 metre deep west Pacific warm pool at 29 C is 0.5 metre higher than the east Pacific cold pool at 20 to 22 C.
Using pure rather than sea water for simplicity, a 22 to 29 C temperature difference for a 30 metre deep pool implies a height difference of 0.57 metres. Where does that leave the reported 0.5 metre height difference said to be due to the trade winds? Oops, a typo. That should have been a 300 metre deep warm pool. Sorry. Phil Clark: I have to admit I’ve simply repeated the 0.5 meter height difference I’ve found at numerous websites. I’ve never tried to calculate it. And yes, the trade winds would have to contribute. If you were to scroll ahead to Figure 3-27, you can see the differences in sea level anomalies across the equatorial Pacific between Dec 1996 (ENSO neutral), Dec 1997 (El Nino) and Dec 1998 (La Nina). On sea levels before, during and after an El Nino event, I tabulated hourly sea level data for the four years 1995-1998 from Baltra, Galapagos Is. (-0.44 S, -90.63 W) and Lombrum, Los Negros, PNG (-02 02 S, 147 22 E) representing the east and west equatorial Pacific Ocean respectively as a guide. During the 1997-98 El Nino, sea level at Lombrum was lowered by around 0.25 m from March 1997 until October 1998 while sea level at Baltra went up around 0.2 m from Feb 1997 until April-June 1998 with a peak at around 0.4 m for Nov and Dec 1997. The lowered sea level at Lombrum was a two step affair – down around 0.15 m then a further drop to 0.25 m down between September 1997 until February 1998 then back to 0.15 down until September 1998. Bob, you quote figure 3-27 in your book which shows the differences in sea level anomalies across the equatorial Pacific between Dec 1996 (ENSO neutral), Dec 1997 (El Nino) and Dec 1998 (La Nina). While your diagram agrees in general with the sea level height numbers noted above, it’s interesting that there is no additional east-west sea level height difference that might be expected to result from the stronger La Nina trade winds – if the trade winds cause the sea level height differences as is claimed. Figure 3-27 raises another query – if the east and west sea level heights are similar for both normal and La Nina events, is there a plausible explanation for the progressive height differences across the mid-Pacific? Phil Clark: The sea level data presented in the book is satellite-based data, so it should differ slightly from the tide gage data. The sea surface temperatures in the western tropical Pacific shifted warmer in response to the 1986/87/88 and 1997/98 El Nino events. The sea level anomalies should be reflecting the same process (ENSO)-related increases. I would buy a Kindle version. Please do one. Andy: I might publish a Kindle version, but it’s not going to be anytime soon. I would do so if demand for it grew so great that I needed to shift it to Kindle to reduce my workload, and I don’t foresee that happening. Right now, I’m not having any trouble. What I’m trying to do is keep it inexpensive so that anyone who wants to read it can. If I switch to Kindle the price doubles due to the size and I have to price the pdf version even higher. Thanks for your interest, though. I’ve got to page 146 and without reading any further (which I am going to do) I see ENSO as a heat pump pumping more heat into the ocean than it is releasing to the atmosphere. I am on the edge of my seat while I wait to see how this will finally balance out. “CO2”, who needs the stuff when this is going on. Bob I love this book, anyone with high school physics can follow the logic. Just another 415 pages to go, and I’m going to love every one of them. “SillyFilly” your name says it all. Thanks for the kind words. I hope you enjoy the rest. Pingback: Tisdale asks: Hey, Where’d The El Niño Go? | Watts Up With That? Pingback: Tisdale: How Much of an Impact Does the Atlantic Multidecadal Oscillation Have on Arctic Sea Ice Extent? | Watts Up With That? Steven Devijver: Thanks for the link. You are aware of my doubts about the met textbook story about trade wind changes causing El Nino events – an explanation that originated in the very early days of meteorology. The following text outlines an alternative El Nino hypothesis for discussion. Earthquake research naturally focuses on catastrophic seismic events such as the March 2011 Tohoku-Oki earthquake in the Pacific Ocean seafloor near the Japanese east coast, which moved the ocean bed an estimated 50 meters laterally and 7 meters vertically. Catastrophic earthquakes are most often associated with subduction zones where one tectonic plate overrides another generating extreme stresses that are occasionally relieved by a sudden earthquake slip or succession of slips. The sudden ground movement and release of pent-up energy can result in disastrous consequences and also generates seismic signals that enable identification of the earthquake’s location, depth and magnitude. On the other hand, at spreading zones where tectonic plates are moving apart with hot magma pushing up from below, earthquake energy sources are much reduced and confined to near-surface crust depths. While the Tohoku-Oki subduction zone earthquake intensity was measured at 9.0, the seismic intensity of a spreading zone earthquake which resulted in similar sea bed movements would tend to be significantly less. The sea bed movements associated with the Tohoku-Oki earthquake changed the distribution of the Earth’s mass with three noteworthy downstream impacts. The Earth’s axis was shifted by between 10 cm and 25 cm, the speed of Earth’s rotation was increased making the days 1.8 microseconds shorter and the GPS station located nearest the epicenter was moved almost 4.0 m. The axis shift implies a question about whether similar seismic events combine to contribute toward the progressive deviation between Earth’s axial and magnetic poles. The GPS station movement poses questions about the accuracy of satellite sea level measurements. As spreading zone earthquake sea bed movements could be similar or even larger but with significantly lower intensities, correlation of their downstream impacts would be less obvious and could fail to be identified. Why am I posing this scenario? Because a significant sea floor upward movement associated with an East Pacific Spreading Zone earthquake would tend to also raise surface sea level in that neighbourhood, a rise that would be opposed by gravity resulting in changes to ocean current speed. The 2 kilometre high sea floor ridge associated with that spreading zone area enhances the probability of impacts on the major Pacific Ocean circulating (gyre) currents without the apparently minor intensity earthquake being identified as a potential causative factor. And why should that be significant? Because any factor with the potential to inhibit or stop the major ocean (not limited to the Pacific Ocean) circulating current flows poses the probability of enhanced equatorial solar energy absorption across the slowed current, raising sea surface temperatures and consequent evaporation rates. In other words, creating an El Nino event without the need for a meteorological textbook wind change. And it saves having to hypothesise why the trade winds might want to change! Phil Clark: It sounds logical that earthquakes could trigger an El Nino event. There are some speculative papers that try to say that El Ninos could be triggered by strong volcanic eruptions that occurred years prior to the El Nino. But the temporary change in sea level associated with the tsunami after the earthquake would have to be high enough to counter the force of the trade winds which is “holding” the higher sea levels in the PWP in place. Also, the factors (Westerly Wind Bursts) that initiate the weakening of the trade winds have been identified. They’re basically weather events, such as tropical cyclones in the western tropical Pacific. Refer to Chapter 4.15. “One of the primary messages of this book is that there is NO EVIDENCE that downward long-wave (infrared) radiation warms the oceans. No evidence whatsoever.” (p.504). Donald, there is nothing in the Ocean Heat Content data to indicate that Downward Longwave Radiation (IR) has had any impact. The fact Total Solar Irradiance (TSI) has been relatively constant fails to consider that ENSO is the process through which tropical cloud cover varies and allows downward shortwave radiation to enter the oceans. That is, the only time tropical OHC warms significantly is during 3-year La Nina events—and during the unusual 1995/96 La Nina. Between those 3-year La Nina events, tropical Pacific OHC cools—contradicting what you’re saying should happen because of Downward Longwave Radiation. Also, if it wasn’t for a 2-year period in the late-1980s, North Pacific OHC would have cooled since 1955. I think that you are right that ENSO controls sea surface temperatures. But there are plenty of measurements that indicate that overall ocean heat content down to significant depths has been rising for many years. Of course, the oceans are so vast that this increase in heat content corresponds to a small delta-T. This is for the whole ocean, not just the near-surface waters. For example, Levitus et al (2012) report that oceans have been warming at the rate of something in the neighborhood of 0.5 W/m^2 for the past 50 years. The mechanism for this is the extra downward IR from rising CO2 raises the surface temperature slightly, which inhibits heat loss from the oceans via convection, thus increasing the heat content of the oceans. In other words, just because the IR is absorbed at the surface does not mean it won’t lead to heating of the oceans. Superimposed on this continuous heating of the oceans is the behavior near the surface that you have so elegantly described in your book. Since the behavior of atmospheric temperatures is mirrored in the El Nino indexes your thesis that air temperatures have been determined more by ENSO than CO2 these past 30 years still makes sense to me. All Mother Nature needed to do was throw a switch called sea level pressure for the North Pacific. It changed the rate at which the warm water is transported poleward. Obviously, the switch caused warm water to collect. Presto, the North Pacific warmed in a step over two years. CO2 may make sense to you, but it does not make sense to me. Bob – I have downloaded your book, thank you. I recently watched a National Geographic movie on the volcanic ridges that abound under the ocean and they stated that the energy being released from them is, if I remember correctly, 17,000Bn watts (possibly should have been watt/hours) and this was equated to the energy used by mankind in one year. Neither your book nor any internet search gives me any estimate of what this energy figure is accepted to be and I do not see this being allowed for in the energy balance diagrams used to explain global warming (eg, sun energy in, reflections, re-radiation, etc). Given this energy is being constantly released into the world’s oceans and is another source of energy into the system other than the sun, why is it not being used more in papers such as you and ‘climate scientists’ produce? Is this energy insufficient to effect such a large body of water and thus can be discounted? Hi John (in Oz). Thanks for buying the book. I hope you enjoy it. A good number of years ago I also wondered about the contributions of subsurface volcanic eruptions and ridges and thermal vents to the total heat of the oceans. I can vaguely recall a couple of calculations on blogs about volcanoes that showed how little the contribution was and there may be a paper or two about the subject. I can’t recall where I found them, sorry. And I can’t remember what search terms I used: volcanoes + ocean heat content? But yes, I believe they could be discounted. A back of envelope estimate for the warmest segment of the Earth’s crust, the East Pacific spreading zone is around 3500 GW thermal contribution. Regards, Phil also from Oz. At an estimated 60 mW/m2 upward thermal flux from the crust for the whole Earth, the contribution would be around 30 TW. While that’s quite a lot of heat, it pales into insignificance when compared with the Sun’s estimated contributions of 342 W/m2 at top of atmosphere and 168 W/m2 at Earth’s surface, John. Bob, IMHO the ‘downward long wave IR re-radiation’ tale and its supposed association with CO2 and other ‘greenhouse gases’ are both hypothetical devices developed to provide the appearance of scientific explanations for events that the proponents cannot or prefer not to understand. By way of example, the Kiehl-Trenberth global energy budget diagram given prominence in IPCC reports presumably warns us that we need more protection from the hypothetical 324 W/m2 ‘back radiation’ than from the less significant 198 W/m2 incoming solar radiation. Hello nightburn, goodbye sunburn! 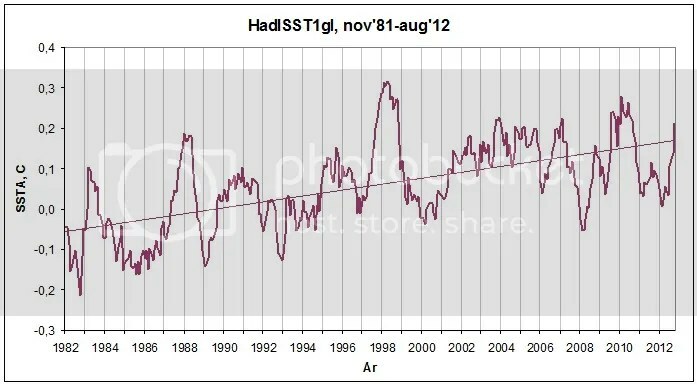 Pingback: Tisdale’s September 2012 Sea Surface Temperature Anomaly Update | Watts Up With That? Pingback: Bob Tisdale’s dirty weather control video – rated RR* | Watts Up With That? Thanks, slimething. I’ll prepare a post about it. 1) If nature exhibits such strong natural variability of tropical Pacific SSTs on centennial time scales, then assumptions that the observed trend over the past century to a century and a half is a response to radiative forcing are tenuous. It could in fact be that the observed trend over the past century and a half is merely reflective of internal variability. If so, it could strengthen or weaken in the future as the natural variability evolves. This will combine with, and potentially interact with, any forced response and thus have implications for tropical Pacific and global climate. 2) If the centennial variability in the models is spurious, then it nevertheless is a robust component of the three analyzed models, is likely to exist in othermodels, and therefore will continue to influence coupled GCM projections of future climate, as well as initialized decadal hindcasts and forecasts conducted withGCMs. In all cases, it must be known at what stage the natural centennial variability exists at the beginning of a forecast or projection to isolate the forced change from the modeled internal variability. Hi, Bob. I have bought and read your book. Truly enjoyable! It really is so blatantly obvious where the warming is coming from. And you’ve demonstrated it in excellent style! Have you ever considered that there’s no lagged response in the western ENSO sector to what happens in the eastern? They’re both interconnected oceanically, producing the ENSO signal together, in real time. I have a hard time seeing any atmospheric teleconnections controlling West Pacific’s SST evolution, when the sea water is flowing so freely back and forth between that region and the region to the east of it. To my mind at least, the western response is simply generally inverse to the eastern, but they’re basically synchronous all along. What you see in the East Indian-West Pacific dataset is that some time before the peak of the El Niño a pulse of warm water is ‘coming back’ from the East. But this in-phase behaviour of the West toward the East before, during and after the peak of the El Niño is continued as the drop towards La Niña territory starts, only now in the normal counterphase – for a while. That is, the SST in the West starts rising abruptly and markedly just before the apex of the El Niño and continues rising as the subsequent descent commences. One can actually see this ‘fallback’ (or rather spreading) of warm water also westwards late in the development of the significant El Niños in specific SST map time series. Also, at some point during the drop towards the following La Niña (1988/89 and 1998/99), the western response goes back into (a general/directional) in-phase or nonresponsive mode, so that the SST curve of the West either follows or stays flattish compared to the eastern. This goes on until just before the rise towards the first following El Niño (1991/92 and 2002/03), when the West suddenly shifts back to the more common inverse mode. Strange things. But interesting indeed. There are time lags associated simply with the warm water sloshing back and forth. That is, it takes a couple of months for the water to travel the distance between the eastern and western tropical Pacific. The Kelvin wave takes about 2 months traveling eastward and the Rossby waves take about 6 months traveling westward. And when the trade winds resume after an El Niño, it takes a number of months for them to push the left over warm water back to the west. Also, if we watch the animation, we can see the impacts of the El Niño event as they travel eastward into the Atlantic and Indian Oceans. Thanks, Bob. A good, clarifying answer. Something I can use. I have bought your book and look forward to reading it. Now, just one question before I delve into it. Why is it SST trends since 2003 do not correlate ARGO OHC during the same time period? Now that the Goose Barnacles are suffering and the Calcareous sponges are leaving us, all this talk about El Nino and La Ninas is pointless. Oh, my!! Back to the bar and another bottle of stress relief. You may also note that my last update of the NODC’s OHC data was back in January 2012. The reason I haven’t updated since then: I no longer believe the NODC’s ARGO-era OHC data is credible. It has been adjusted to the point that it no longer makes sense. Here’s a comparison of standardized UKMO EN3 Global OHC data and Reynolds OI.v2 sea surface temperature data. The 0-2000m OHC data is basically flat. The 0-700m data has a negative trend and so does the sea surface temperature data. Note how both OHC datasets cool during El Niño events and how they warm during La Niña events. Everything fits logically into place. I’ve replaced the 0-2000m UKMO EN3 data with the NODC OHC data (0-700m) in the next graph. The dip and rebound in the NODC data that’s in response to the 2004/05 El Niño appears excessive. It, of course, increases the ARGO-era trend in the NODC data. Then the NODC OHC rises during the 2009/10 El Niño, which appears wrong, especially when the UKMO data appears to respond correctly with a dip. nevket240: Are you trying to make be jealous, letting me know you live somewhere warm, when nighttime temperatures in Newfoundland are approaching freezing? Of course, presenting the correct cause of the warming of the global oceans is necessary, and that’s what I’ve done over the past 3 ½ years with all of this discussion of El Nino and La Nina. Regarding “ocean acidification”, that’s a topic for other blogs—not here. Everyone understands “ocean acidification” is misleading, since the oceans are not acidic. They’re simply becoming less basic. When and if they become acidic, then the term “ocean acidification” will be correct. If you’re a scientist, maybe you should apply for grants to study the impacts of propeller wash, of gasoline- and oil-fume permeation and of gasoline and oil leakage on coral. With all of the sightseeing and research vessels, one might assume they’ve had an impact on coral. Pingback: Another model failure – seeing a sea of red where there is none | Watts Up With That? Sebastián Magallanes: Thanks for buying the book. I hope you enjoy it. That’s BTW NINO3.4 (ERSST.v3b) scaled down 7.5 times vs. HadSST2gl (adjusted down 0,09 C in January 1998 to account for Hadley Centres data source switch that year). Kristian: Nice animation. May I suggest using HADISST for the NINO3.4 and Global sea surface temperature dataset. That way you don’t have to tweak the HADSST2 data. Pingback: Tisdale: Where’s The Anthropogenic Global Warming Signal in the NODC Ocean Heat Content Data (0-700Meters)? | Watts Up With That? Pingback: Tisdale video on ‘dirty weather’ part two | Watts Up With That? Is there a bug in the search bar? Every time I click on it, I’m redirected to PayPal. slimething, did that cure it? Need to pester one of my work colleagues to buy this for me as I don’t have a PayPal account! Very much looking forward to reading this book with my interest in La Nina and the effect on British winters. Because of this, when trying HadISST1 global vs. scaled NINO3.4 SSTA, the trend of the former did no longer follow the trend of the latter between the upward shifts, like with the other data sets. There’s a divergence pointing towards some kind of ‘global warming’ on top of the ENSO signal. Both HadSST2, ERSST.v3 and Kaplan’s SSTA curves share Reynold’s distinct steplike evolution. Conclusion: I don’t trust the HadISST1 data set. Another strange thing, I checked HadSST2 NINO3.4 SSTA against the equivalent Reynolds OI.v2 curve. And guess what – they fitted almost perfectly all the way through. No apparent inhomogeneity in 1998. No need to adjust anywhere. So where is this clear artificial global shift hiding? Kristian: Thanks for the feedback. 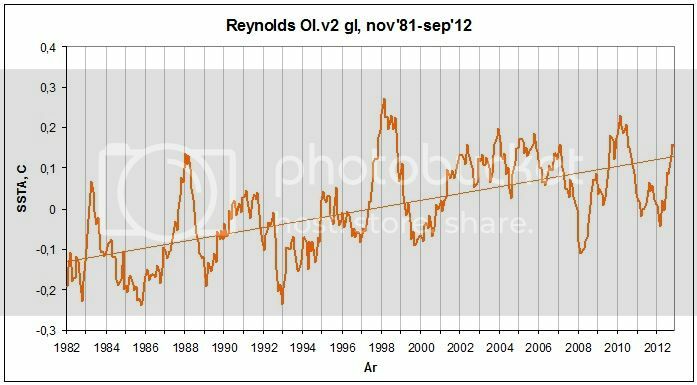 I’m generally not concerned about HADISST data during the satellite era since I always use Reynolds OI.v2 for evaluations of the last 30 years. I don’t know that I’d call the HADISST data GISSified, though I do like the term for a dataset. I had always understood the differences between Reynolds OI.v2 and HADISST to be a function of the satellite corrections. But I also haven’t examined HADISST for signs of the suppression of the upward steps. That would be an interesting twist. Thanks again for your insights and comments. Historical Weather: You don’t need a PayPal account. Simply scroll down past that section that asks you to open an account. Sorry for the delay in moderating your comment. For some reason, it rolled over to the spam filter. I’ll have to check that more often. Bob, why did you out a commenter’s personal information in a reply here? Stay classy. Pingback: An Inconvenient Truth: Sea Surface Temperature Anomalies along Sandy’s Track Haven’t Warmed in 70+ Years | Watts Up With That? I just purchased your book and was emailed the download link. However, when I click the link it just says fetching files, please wait. It has been doing this for the past 20 minutes with no change. Are there any alternative download links I could try? Josh, check you email. I replied there. In section 2 you mention that the AMO is contributing to the warming of the global oceans in recent decades, and justify that the AMO is a mode of natural variability based Chylek et al (2012). Tamino seems to completely discredit the existence of the AMO cycle. Nope. Tamino attempted to discredit the existance of the AMO in the Dye3 data used by Chylek et al. He hasn’t proved that it doesn’t exist. Personally, I don’t have a sufficient background in statistics to know if Tamino is pulling one of his normal misdirections, so I can’t comment on that post. …which confirm the existance of the AMO prior to the epoch of the instrument temperature record. Also, there are other climate model studies that contradict Booth et al (2012) and argue for the natural existance of the AMO, but then one would have to assume climate model studies are credible…I don’t. I generally dismiss them as nonsensical exercises in programming. The programmers generally set out to confirm their beliefs with the models and then simply assemble the right mix of dubious forcings to generate the desired outputs. ENSO cycles originate from natural causes, as do other longer-term cycles which have a greater effect on climate. Natural cycles determine energy balance, not the reverse. Richard S Courtney gives a detailed explanation in this post explaining how there may be slight net warming of oxygen and nitrogen molecules resulting from prior absorption of IR by carbon dioxide molecules. Clearly he agrees that the effect is only slight. But what then happens to the additional kinetic energy in the oxygen and nitrogen molecules? Well, firstly, assuming they are cooler than the surface below, the thermal energy cannot be transferred back to the surface by non-radiative processes. One way or another it must eventually escape to space. But why to space? Don’t the energy diagrams show (more than) half being returned to the warmer surface by radiation? This is where the biggest misunderstanding occurs. Radiation from a cooler source can do one and only one thing when it strikes a warmer surface. It slows the rate of that portion of surface cooling which is due to radiation. It does not do this by transferring heat to the surface. Because there is no heat transfer, there can be no slowing of non-radiative cooling processes. In fact, these processes can and do accelerate to compensate for the slower radiative cooling. What happens is that the energy in the radiation from the cooler atmosphere can only be used to supply equivalent energy to the surface which can only be used for the purpose of creating equivalent upwelling radiation with the same frequencies and intensities. This energy is thus used by the surface (instead of some of its own thermal energy) to meet some of its Planck “quota” of radiation. Its own Planck curve always fully contains the Planck curve of the radiation from the cooler atmosphere. But the radiation corresponding to the area above the cooler Planck curve, but under the warmer one will transfer heat. This is an empirically confirmed result, demonstrated over and over again. The area between the Planck curves represents the one-way heat transfer from the warmer body to the cooler one. There is no physical heat transfer the other way. The radiation from the cooler body is immediately re-radiated without any of its electro-magnetic energy ever being converted to thermal energy in the target. Hence most of the observed (or calculated) upwelling radiation from the surface is not actually transferring heat from the surface. Rather it is merely sending back the energy that was in the backradiation. The whole process is very-similar energy-wise to diffuse reflection. What then are the consequences of this discussion? Well, firstly the heat that is transferred from the surface to the atmosphere is mostly transferred by non-radiative physical processes such as molecular collisions which may be called conduction or diffusion. Using K-T energy diagrams, and remembering that that the amount of backradiation should be deducted from the upwelling radiation from the surface (because this amount is not transferring energy from the surface) then we can calculate that less than 15% of all energy transferring from the surface to the atmosphere does so by radiation. But, more importantly, the non-radiative cooling processes significantly dominate the actual transfer of energy from the surface to the atmosphere. Any slowing of radiative cooling will leave a bigger temperature “step down” between the surface and the adjoining air. So non-radiative cooling processes will simply accelerate (as physics tells us) and have a compensating effect. So there will be absolutely no net overall effect on surface cooling. That is reality. The 33 degree of warming claim has been absolutely rubbished in various PSI papers. Just browse the publications menu on our Home page. There is no such thing as a greenhouse gas, because there is absolutely no atmospheric greenhouse effect caused by any gas or water vapour. The temperature of the surface is determined by incident solar radiation levels and the adiabatic lapse rate, the latter being a function of gravity. Pingback: Inverse hockey stick – Hurricane Sandy cools the ocean | Watts Up With That? Pingback: ‘Skeptical Science’ Misrepresents Their Animation “The Escalator” | Watts Up With That? Pingback: Mythbusting Rahmstorf and Foster | Watts Up With That? I received this message about your online pdf book I paid for: “The product Who Turned on the Heat? – The Unsuspected Global Warming Culprit, El Niño-Southern Oscillation formed part of a purchase you previously made and has just been updated by the merchant. In receiving this email you have been given access to the updated version that can be downloaded by visiting the order URL: [snip] Please note this is a timed link that will expire at 11:07AM on November 15th 2012” Unfortunately, I was away for a couple of weeks and did not have tbe time to download within the very restrictive time. Is there anyway to get the updated copy at this point? John Chipman, please check your email. I just sent you another copy. Pingback: El Niño-Southern Oscillation Myth 1: El Niño and La Niña Events are Cyclical | Watts Up With That? Pingback: Once again, reality trumps models – Pacific SST’s are flat | Watts Up With That? I purchased your book yesterday but had a lot of trouble getting the download to get all the way through (a problem with my internet access during the day). Now the download has expired. Any chance of a new link please. It’s on the way. Please check your email. Thanks for buying the book. Pingback: El Niño-Southern Oscillation Myth 2: A New Myth – ENSO Balances Out to Zero over the Long Term | Watts Up With That? Another request for a Kindle version please. Pingback: Blog Memo to John Hockenberry Regarding PBS Report “Climate of Doubt” | Watts Up With That? Hi Bob, bought your book soon after it was “published” and thoroughly enjoyed it. As a layman I found I was able to follow the plot as it were (had to reread a few things but got there in the end). I tried uploading to my Kindle via Calibre software and whilst it works to point it is not totally satisfactory. However you may recall we had a brief communication on Anthony Watts site concerning the possibility of transferring to Kindle when I mentioned the Calibre software? I have researched this a bit more and it would appear there may be a way of converting to Kindle format from the original Word file you used. Would it be possible to send the Word file and I can have a play to see what transpires – if I’m successful obviously I’ll advise you accordingly and you can take it from there if you wish. Pingback: El Niño-Southern Oscillation Myth 3: ENSO Has No Trend and Cannot Contribute to Long-Term Warming | Watts Up With That? Pingback: Drought, Hurricanes and Heat Waves – 2012 in Perspective | Watts Up With That? Pingback: Warming Rate in the US Slowed during the Recent Warming Period | Watts Up With That? I just purchased your book and began to read it. I apologize for jumping ahead but I’ve always had a thought in my brain about El Nino and La Nina. Can these events be further exaggerated by earth’s orbit around the sun? Specifically, and I’m not a scientist, earth’s orbit precesses the sun in an orbit that varies over time. When the Southern hemisphere is in a summer phase, couldn’t the two events you describe be enhanced if the earth were closer to the sun because of the larger body of water – ocean – in the southern hemisphere. Michael, thanks for buying my book. The seasonal cycle, as you’ve suspected, does play a role in ENSO, along with a multitude of other factors. Refer to chapter 4.7 “ENSO Events Run in Synch with the Annual Seasonal Cycle”. The term ENSO ‘phase locking’ is often used to describe it in papers, if you want to study it more. Make sure you’re looking at data-based and not model-based studies, though. Climate models have lots of problems with ENSO. Pingback: ENSO 2013 – Boy or Girl? | Watts Up With That? ENSO is caused by natural climate cycles. It is not itself the cause of climate change. Actually, it is. 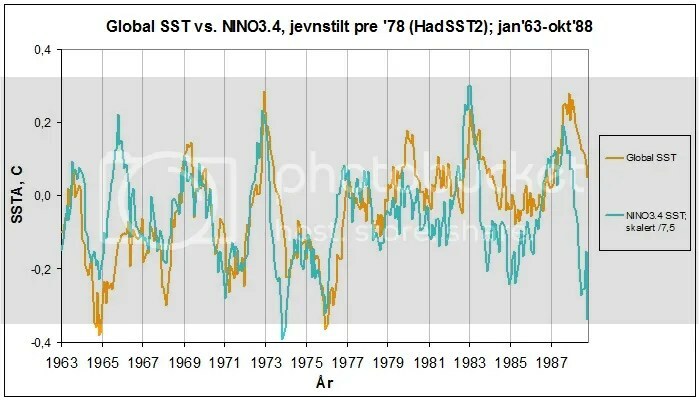 Sea surface temperature and ocean heat content data both indicate the oceans warmed naturally–primarily through ENSO. And the processes of ENSO presented in this book are confirmed with multiple datasets, including sea surface temperature, sea level, ocean currents, ocean heat content, depth-averaged temperature, warm water volume, sea level pressure, cloud amount, precipitation, the strength and direction of the trade winds, downward shortwave radiation, etc. minor typo on page 11: “it’s cycle” should be “its cycle”. Bob, you can remove this comment after you have seen it. Thanks for the find, Chris. The possessive form of it is tough to catch when proofreading. I’ll leave your comment here as a reminder in case I need to publish a 3rd edition. Thanks also for buying a copy and feel free to let me know if your find anymore typos. Do you ever give seminars? As I wrote above, I am not a scientist, my background is in Landscape Architecture and botany. Although I do have a very good feel for the interactions, sometimes we learn a lot more through discussion …mother nature freely associates and by analogy, predicting her is like walking into a ballroom full of guests and predicting the interactions between all of those guests and how those interactions will influence their lives after the ball. Apologies for the animated analogy, but I use it often. Pingback: NOAA SOTC Claim that 2012 Was Warmest La Nina Year is Wrong | Watts Up With That? Michael, I haven’t given a public presentation in over two decades. I would not feel comfortable giving one now. You know how terrible a presentation can be when the presenter isn’t comfortable giving it. Did you notice my appearance on the WUWT-TV special was prerecorded? That’s why. This might be of interest. I think it generally supports your book. Pooh, Dixie: Thanks for the links. Your book is denser than my attention span, so I keep having to come back read some more, stop ,think and repeat. My apologizes if the book answers this. Arctic sea ice is a hot topic here in the NWT Canada. Is there an animation of the arctic part of the cycle, as the warm water sloshes back to the west, curls north toward Japan, then up past siberia and then some thro the bering strait into the arctic? Same question with the Atlantic cycle. What is the time lag from El Nino to arctic ocean warming in which areas of arctic. When the rossby wave is displaced further north, does more warm water reach the arctic? Do the satellites cover the sea surface temperatures over the poles? John Robertson: I have done very little analysis of sea surface temperatures in the Arctic Ocean, primarily because its availability depends on sea ice extent, and because there are so many factors that contribute to sea ice loss. Sorry I couldn’t have been more helpful. Pingback: New ebook: The Manmade Global Warming Challenge | Watts Up With That? Pingback: NOAA corrects ‘State of the Climate’ – offers no credit | Watts Up With That? Pingback: Bob Tisdale shows how ‘Forecast the Facts” Brad Johnson is fecklessly factless about ocean warming | Watts Up With That? Pingback: New video from Bob Tisdale explains The Impact of Manmade Global Warming on a Blizzard Called Nemo and on Hurricane Sandy | Watts Up With That? Pingback: Another Model Fail – | Watts Up With That? Pingback: CMIP5 Model-Data Comparison: Satellite-Era Sea Surface Temperature Anomalies | Watts Up With That? Pingback: Aerosols from Moderate Volcanos Now Blamed for Global Warming Hiatus | Watts Up With That? Pingback: Blog Memo to Lead Authors of NCADAC Climate Assessment Report | Watts Up With That? Pingback: Is Ocean Heat Content Data All It’s Stacked Up to Be? | Watts Up With That? Pingback: Why Do El Niño and La Niña Events Peak in Boreal Winter? | Watts Up With That? Pingback: On Dana1981’s Meaningless ENSO Exercise at SkepticalScience | Watts Up With That? Pingback: ENSO Myth Number 4 – The Variations in the East Pacific and the East Indian-West Pacific Sea Surface Temperatures Counteract One Another | Watts Up With That? Pingback: ENSO Myth 5 – ENSO Only Adds Noise to the Instrument Temperature Record… | Watts Up With That? Pingback: A Different Perspective of the Equatorial Pacific and ENSO Events | Watts Up With That? Pingback: Imagine What Would Happen If We Didn’t Have A Strong El Niño For 4 More Years | Watts Up With That? Pingback: Dana Nuccitelli Misleads and Misinforms in His First Blog Post at The Guardian | Watts Up With That? Pingback: Joe Romm Predicts “…All But Certain Ruin for Modern Civilization…” from a NOAA Fisheries Press Release | Watts Up With That? Pingback: Ocean Heat Content (0 to 2000 Meters) – Why Aren’t Northern Hemisphere Oceans Warming During the ARGO Era? | Watts Up With That? 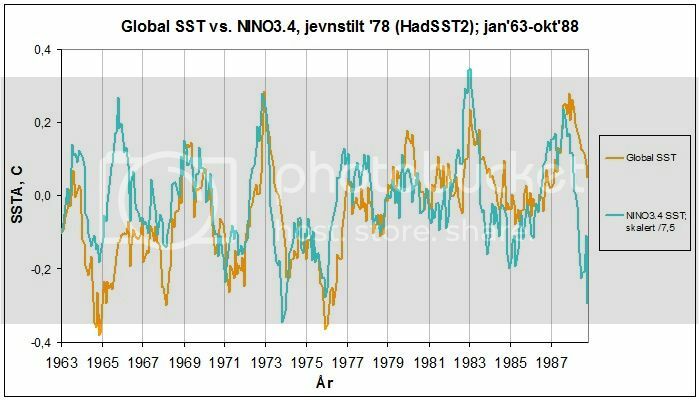 Pingback: SkepticalScience Still Misunderstands or Misrepresents the El Niño-Southern Oscillation (ENSO) | Watts Up With That? Pingback: Multidecadal Variations and Sea Surface Temperature Reconstructions | Watts Up With That? Pingback: Hurricane Main Development Region Sea Surface Temperatures & Anomalies – Plus a Couple of Other Regions | Watts Up With That? Pingback: NODC Provides 1st Quarter 2013 Ocean Heat Content Update & Alarmist Writes Science Fiction | Watts Up With That? Pingback: May 2013 Sea Surface Temperature (SST) Anomaly Update | Watts Up With That? Pingback: A Very Ridiculous Comment by the Author of a Recent SkepticalScience Post | Watts Up With That? Pingback: Sea Surface Temperature and Anomalies Along the Projected Track of Tropical Storm Dorian | Watts Up With That? I purchased your ebook last September (great work btw). Problem I’m running into now is that whenever I try to load the PDF on my phone for reference I get a ‘password protected’ signal. Any ideas what I can do to bypass that? Or is there some password that needs to be entered? copernicus34: Sorry, that’s the first I’ve heard of that problem, and I have no idea what could be causing it. I never used a password on the document. I wonder if it has to do with the watermarking or its size. I can’t do anything about the size but I can get you a copy without the watermark. Do you want to try that? Bob – thanks for your quick response and I apologize for my belated one. Did some digging and I can indeed bring up the PDF on the phone and iPad, but when i store the PDF in the ‘cloud’ i can’t read it. Strange. I’m going to research it some more, thanks again for your offer; at this point I can’t see the need for a watermark free copy. Thanks. Pingback: Models Fail: Land versus Sea Surface Warming Rates | Watts Up With That? Pingback: IPCC Still Delusional about Carbon Dioxide | Watts Up With That? Pingback: AMAZING: The IPCC May Have Provided A Realistic Illustration | Watts Up With That? Pingback: Will Global Warming Increase the Intensity of El Niño? | Watts Up With That? Pingback: Dana Nuccitelli Can’t Come to Terms with the Death of the AGW Hypothesis | Watts Up With That? Pingback: ENSO Basics: Westerly Wind Bursts Initiate an El Niño | Watts Up With That? Pingback: Tamino Resorts to Childish Attempts at Humor But Offers Nothing of Value | Watts Up With That? Pingback: Comments on Stefan Rahmstorf’s Post at RealClimate “What ocean heating reveals about global warming” | Watts Up With That? Pingback: October 2013 Global Surface (Land+Ocean) Temperature Anomaly Update | Watts Up With That? Pingback: Open Letter to Lewis Black and George Clooney | Watts Up With That? Pingback: Trenberth and Fasullo Try to Keep the Fantasy Alive | Watts Up With That? Pingback: Questions Policymakers Should Be Asking Climate Scientists Who Receive Government Funding | Watts Up With That? Pingback: RealClimate Co-Founder Exposes His Inability to Grasp Complex Subjects | Watts Up With That? Bought a copy of “Who Turned On The Heat” last week… downloaded it onto my Kindle and started reading and the PDF froze about 20 pages into the book. Now I cannot open the PDF and will not transfer from my Kindle to my PC. If it is not too much trouble, I’d really like access to another download, but the SendOwl Robot says time has expired. I won’t post the transaction number here, but I would via direct email. Larry, please give me 10 minutes and then check your email. Pingback: Why Aren’t Global Surface Temperature Data Produced in Absolute Form? | Watts Up With That? Pingback: El Niño and La Niña Basics: Introduction to the Pacific Trade Winds | Watts Up With That? Pingback: It Isn’t How Climate Scientists Communicated their Message; It’s the Message | Watts Up With That? Pingback: On Chylek et al (2014) – The Atlantic Multidecadal Oscillation as a Dominant Factor of Oceanic Influence on Climate | Watts Up With That? Pingback: Maybe the IPCC’s Modelers Should Try to Simulate Earth’s Oceans | Watts Up With That? Pingback: El Niño Residuals Cause the C-Shaped Warming Pattern in the Pacific | Watts Up With That? Pingback: Answer to the Question Posed at Climate Etc. : By What Mechanism Does an El Niño Contribute to Global Warming? | Watts Up With That? Pingback: Lewandowsky and Oreskes Are Co-Authors of a Paper about ENSO, Climate Models and Sea Surface Temperature Trends (Go Figure!) | Watts Up With That? Using PlayPal, I purchased a copy of “What happened to the heat”, but none of the graphs and illustrations are available. Clicking on one of them tells me that they are still on your PC. Reference #0002415399. Larry R Milward, assuming you’re on a Windows-based computer, left-click on the image to highlight it. Then right-click (or control “c”) to copy. Then you have to paste the image to MS Paint and save it in the desired format. I’m curious though as to why you’d want copies of the images alone. I do not want copies of the images alone. I have received all the text but none of the images. Like bacon without egg! Hi Larry. Sorry for the confusion on my part. I’ve just emailed you a link to another copy of “Who Turned on the Heat?” Please look for an email from SendOwl. I had them send me one beforehand, just to make sure the file had not become corrupted. It worked on my computer. If you still have trouble, please update Adobe Acrobat on your computer. Please let me know if the new copy works for you. Many thanks; sorry to say that the shots still do not work, saying that they are still on “C:\Users\Bob\Documents\Book NINO\Section 1-ENSO Cartoons\ … .png”. Sorry to be a bore! Larry R Milward, I don’t know what to say, other than I’m sorry you’re having trouble with the illustrations. This is the first time this problem has occurred and I’ve sold gazillions of copies. Are you attempting to read the book with a program other than Adobe Acrobat? Is your Adobe Acrobat up to date? Another thought, I’m wondering if your computer is having difficulty with the size of the document. Can you see the illustrations in the preview? If so, I could break the book into parts and send you links to, say, the first and second halves. Or I could refund your money, and I’ll be happy to do that. Again, I’m sorry you’re having problems. Pingback: More on the Lewandowsky and Oreskes Co-Authored Paper Risbey et al. (2014) | Watts Up With That? 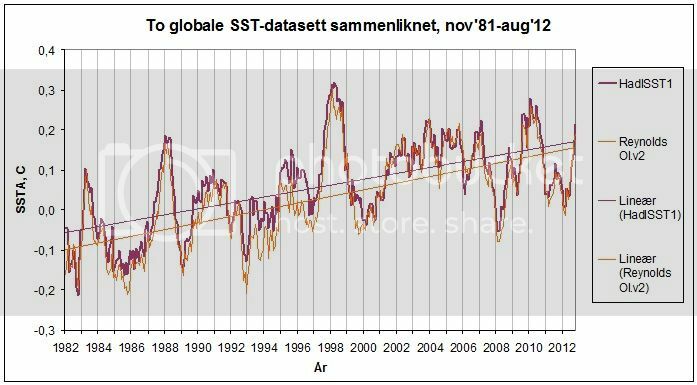 Pingback: Alarmism Warning – Preliminary Monthly Global Sea Surface Temperatures at Record High Levels | Watts Up With That? Pingback: The 2014/15 El Niño – Part 16 – Is There Still Hope for a Moderate El Niño? | Watts Up With That? I just purchased a copy of your book to show my appreciation for your hard work and your contribution. Thank you much, Daryl M.
Pingback: Early twentieth-century warming linked to tropical Pacific wind strength | Watts Up With That? Pingback: An Unexpected Admission from Dana Nuccitelli at SkepticalScience | Watts Up With That? Pingback: ClimateProgress’s Joe Romm Is Promoting a Skeptical View of Global Warming: El Niño-Caused Steps | Watts Up With That? Pingback: Is the Current El Niño Stronger Than the One in 1997/98? In a word, ‘no’ | Watts Up With That? 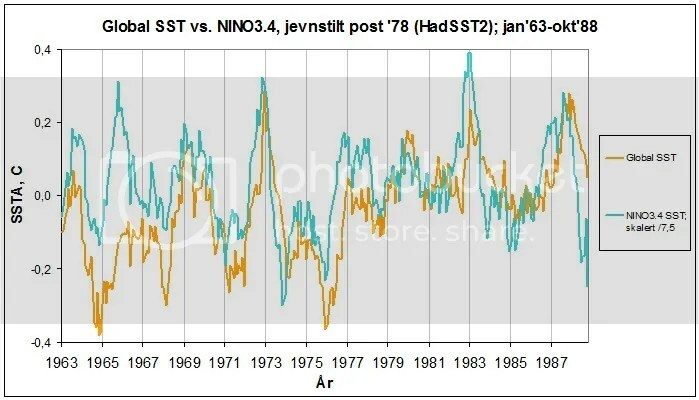 Pingback: The Differences between Sea Surface Temperature Datasets Prevent Us from Knowing Which El Niño Was Strongest According NINO3.4 Region Temperature Data | Watts Up With That? Pingback: Evolutions of Global Surface and Lower Troposphere Temperature Anomalies in Responses to the 1997/98 and 2015/16 El Niños | Watts Up With That? Pingback: March 2016 Update of Global Temperature Responses to 1997/98 and 2015/16 El Niño Events | Watts Up With That? Pingback: Alarmism Cranked Up to Absurd Level | Watts Up With That? Pingback: More Alarmist Nonsense with the Release of the Redundant* NOAA Global Temperature Data for February 2016 | Watts Up With That? Pingback: February 2016 Global Surface Temperature Anomalies May or May Not Have Been Highest on Record, According to the UKMO | Watts Up With That? Pingback: Quicky October 2016 ENSO Update | Watts Up With That? Pingback: Early December 2016 La Niña Update: Mixed Signals from NOAA and BOM | Watts Up With That?